When I tweeted on the Twitter recently that I was making Chocolate Coca Cola Cake, there was a massive flurry of like, two or three people tweeting back at me that they wanted the recipe. Never one to offend my constitchency, I obediently bring you…Chocolate Coca Cola Cake. Check out all those curvaceous C’s lined up like that. Nigella, you alliterative minx. I’ve already told the story of how this was the first recipe I made from How To Be A Domestic Goddess in 2006, but the tl:dr version is that Tim bought it for me, even though we didn’t have any expensive-book-money kicking round, to cheer me up after some clothes I was pretty invested in got stolen off our washing line. What a nice fulla he is. 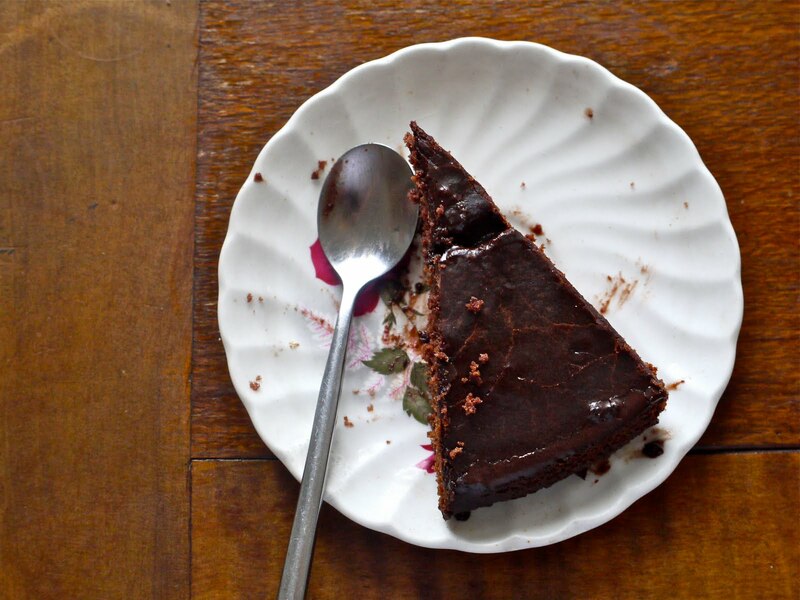 This recipe is fantastic – very reassuringly cake-like, nothing fancy here, but also like no other chocolate cake you’ve ever tasted. Yeah, the Coca-Cola might be a bit of an awkward-sounding ingredient, but it works I promise you. The flavour isn’t strident, but gives a slight lick of damp cinnamony fizziness. It’s easy as to make too – just melt and beat thoroughly till smooth. When I was a kid we never really had fizzy drink around (except on my birthdays when Mum made ice cream sodas) and I never buy it or drink it now but – there’s something SO good about the taste of a cold Coca-Cola. Which is exactly what Coca-Cola would like me to think, but there it is. Preheat oven to 180 C/375 F and put in a baking sheet/biscuit tray to heat up. Butter and paper-line a 22-23cm springform tin. In a large pan, gently heat the Coca-Cola, cocoa and butter together till the butter melts. In another bowl sift together the dry ingredients and pour in the buttery cola. Whisk in the yoghurt and egg, mixing everything really well. Pour into the tin and bake for 40 minutes or until cooked through. Nigella has a recipe for icing that goes with it but it makes a way huge amount. What I did was mix together 1/3 cup Coca-cola, 2 tablespoons cocoa, and enough icing sugar to make a smooth, pourable icing. Even so this made way too much and it flowed over the plate and pooled all over the benchtop. It took so long to clean it up. 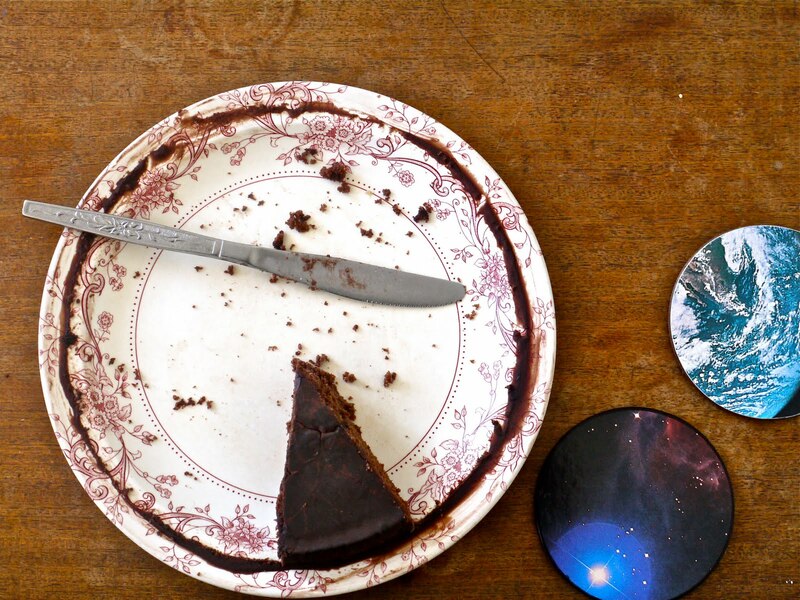 I made this cake to eat with the band Alex The Kid during Tim’s and my interview with them for our blog 100s and 1000s. It was a fun afternoon, and as soon as they left I grabbed my photo and took a couple of snaps. But I waited till they were done. You don’t want to hinder people’s ability to eat this stuff. Check out, if you will, out the sweet coasters Tim and I made! Neither of us tend to go in for crafty cute stuff but something about this project we found in the latest issue – finding old coasters, cutting up pages of old books, glueing them together and spraying with fix-y stuff – appealed. To be honest Tim ended up doing most of it but I spotted the book about the galaxy, and the end result is pretty sassy, hey? Title via: The incomparable (I think my heart beats faster just thinking about her) Idina Menzel who originated the role of Maureen in RENT on Broadway in 1996 and reprised it nearly ten years later in the film version of RENT. The audience’s first sight of her is when she does her fairly astonishing ‘performance art’ piece, Over The Moon, which the title of this post quotes. I kindly but firmly direct you to consult both the original Broadway and film version. Voom, King Kong – apparently this song only came out in 2006 but you hear it and get this feeling like you swear you were listening to it when you were 12. (Depending on where ’12’ was for you). This song (like Ash’s Burn Baby Burn) is made of so many hooks that a more cautious band might have made a whole album from the material crammed into King Kong’s 3-ish minutes. It is fantastic stuff. We managed to see them on Saturday night at Mighty Mighty, so much fun although we missed half their set (including Beth, sniffle) because we were at another gig at Bodega, for Amnesty, where we saw the outstandingly awesome local band Nudge who, for a three-piece, churned out the kind of sound that you’d expect from twelve people. Dead Prez, Hip Hop…love the beat, the chant-along chorus, and how they tip their hat to Trenchtown Rock. I was working at Big Day Out when they came to New Zealand this year but managed to catch the tail end of their set on my shaved ice break. Even from where I was at the back of the field with a tired brain, a mouthful of syrup, and minutes to go before they left the stage, they were pretty electrifying. Next time: 99% sure it will involve tofu. I'm excited about trying this! Truthfully I was going to make my husband make it but maybe I'll give it a go. It's taken me a long time to come around to cooking but I never ever ever bake. I should start, right? I actually tried this recipe like a million years ago, when the book first came out. It didn't come out right (but I think i did the measurements wrong–at the time i was living in the US and i dont think i converted the measures properly). Your post tempts me to try agian. I am so making this! How good does that sound?! And I love your Frankie-esque photography! Have to say, during the very rare moments when I *need* fizzy fizzy sweet sweet (about twice a year), I tend towards pepsi max instead of coke. But can pepsi max make good cake? I'm thinking not. Therefore you win, forever. I've never used Coca-Cola in a recipe!! That “damp cinnamony fizziness” actually sound pretty darn good. Excited to see your 99% possibility of a tofu recipe, or perhaps 1% of a non-tofu recipe next time..
That sounds delish! I recall using (possibly diet!?) coca-cola to make a recipe that involved chicken and tomato ketchup. It was a few years ago but I think it turned into a gooey bbq sauce type thing. I love those coasters! They vaguely remind me of something I would have had/loved as a kid in the 90s… (for some odd reason I had heaps of space-related stuff?!) 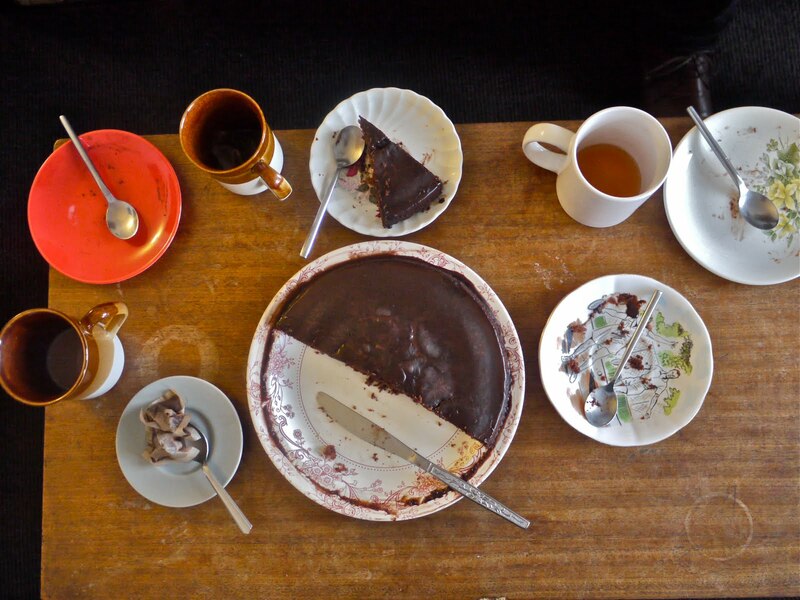 And that cake, so good, and who would have thought to put Coke in a cake? Thank heavens for Nigella. Heavenly Housewife: Yeah – the difference between American measurements and the rest of the world are confusing. When I was a kid I got an American cookbook out of the library and there were so many recipes I couldn't make because they asked for a “stick” of butter…this was pre Google 😀 Let me know if you try it again! Eleanor: Thank you thank you! Bianca: Awwww that turned MY off-day back on again 🙂 thanks. Hannah: I suspect given the chance I'd be more of a Pepsi max gal too…somehow I don't know that it would have the depth necessary for this cake. Yes, coca cola…depth. Sophie: That actually sounds really good. I've seen a BBQ sauce recipe which had coffee in it, also intriguing. If I were going to make a cake – this would be it. But then, I don't tend to keep Coke in the house. And, I guess soda water just wouldn't do it. Love the windchime thingy on your other blog – pity about the name of the person who first posted it – makes it wholly unsuitable for using with my class – who are bound to notice the f- word leaping out from the small priint.